Daniel Rion inherited 2 hectares of vines from his father in 1959. A few years later he inherited more vineyards through his wife's family and produced his first wines in 1962. The domaine now consists of 18.45 hectares of vineyards (some of them are leased) located in Chambolle Musigny, Vosne-Romanée, and Nuits-Saint-Georges. 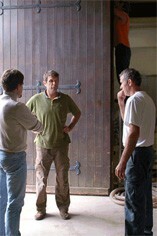 Now run by Christophe, Olivier and Pascale Rion after their brother Patrice left in 2000 to develop his own domaine. The range consists of Côte de Nuits Villages Le Vaucrain, Chambolle Musigny Beaux Bruns, Vosne Romanée, Nuits St Georges Grandes Vignes, Nuits St Georges Vignes Rondes 1er cru, Nuits St Georges Hauts Pruliers 1er cru, Nuits St Georegs Terres Blanches 1er cru (white) Vosne Romanée Beauxmonts 1er cru, Vosne Romanée Chaumes 1er cru, Echézeaux, Clos de Vougeot.